The lens look on my eyes in different lightning. So lovely~! Isn't this contact lens looks nice?? It makes my eyes look so shiny and so natural, I reaaaalllyy love it. The diameter is suit my eyes so nice too! 14.5mm, I hope Geo has 14.5mm but now they're just release 15mm which I think too big for daily use. This lens is really comfortable too, almost like EOS King size. I'm so happy I've natural lens too use for daily now, although I love mimi series but I don't use it daily because I'm afraid the lens will make my eyes can't breathe because the diameter is too big. I loooveee this lens, it makes my eyes look like crystal *w*. 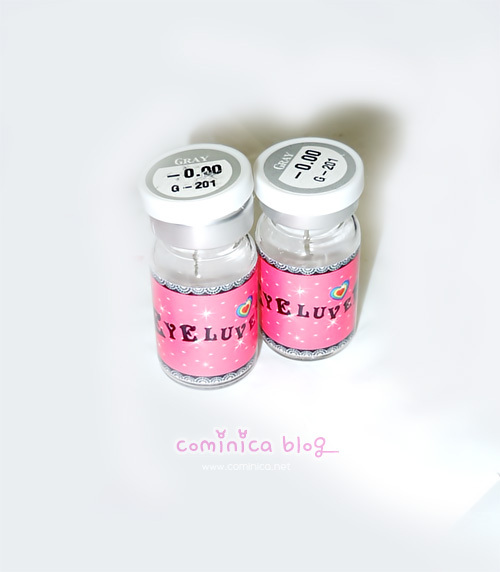 Btw , Lollylens provide a coupon code, the code is : cominica , you can get 10% discount on all contact lens type. Check out their website if you're interested with this lens, they have many choices of lens too! Such pretty lenses, the grey looks really nice on you. ^^ Are they the same as the eos king pure or something. I can't quite remember what they are called. ah.. beautiful.. it reminds me of eos max pure gray actually..
i always want to try that out but it seems like i can't hold myself to spend on another products --"i got dreamy.i in brown too lol..
xD Oh sorry! :( Ah poor Happi, have you tried taking him outside. >_< Or seeing a vet. :( Sick animals make me so sad. So nice lenses, look great on you! anyways, i am hoping these will replace my geo angel gray. You look super dolly and cute in those lens! They look so pretty and natural on you! I'm not much of a fan for gray lenses though.. I like the look of these lenses too but I kind of wish the outer ring wasn't as thick. But still, they are amazing on you! It's awesome to pay a quick visit this web page and reading the views of all mates on the topic of this article, while I am also keen of getting experience. site, i am browsing this site dailly and obtain fastidious information from here all the time.